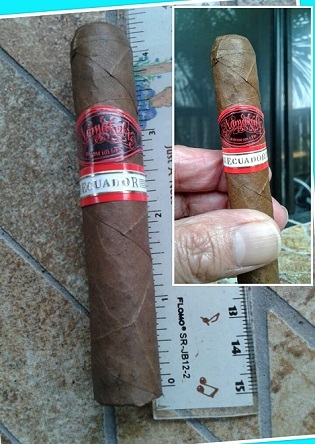 Namakubi Ecuador in the small petit corona is at this time my single favorite cigar. I’ve smoked three vitolas of the same blend. The one smoked here is the largest “toro sized” perfecto at 6.5″x52 in the middle. The one I’m smoking today is the last of a box of 10 now about 18 months old. It’s taken me that long to go through 10 as these things smoke slowly for 2.5 hours! I like the little petit corona (4″x42) much better. The flavors in the corona are sweeter and smoking for 45-55 minutes I can get all the way to the nub without washing out my palate. The little one is called the “Papi Chulo” which, I am told, in Spanish is a kind of slang for a “daddy’s girl” if you know what I mean! The picture has images of both. The wrapper and binder in particular come from the OSOK. There is supposed to be a “regular” Namakubi blend, same filler but with a different binder perhaps. A quick google search doesn’t turn up anything definitively different about it. The wrapper on the perfecto (there are 3 perfecto sizes. I’m smoking the largest one today, but I’ve had both of the smaller as well) is a dark brown color. The corona is a little less dark but this is probably only box variation. Construction of the parejo is superb. The cigar is heavy and well packed, but the draw, is good. A little tigher than I like, but only a little. The draw on the little corona is always perfect but the wrapper and cap can be a little rough as you can see in the second picture. Both cigars produce lots of smoke, very creamy, earth, hay, barnyard, leather. Occasionally roasted cashew and other sweet burning wood flavors come in and out. 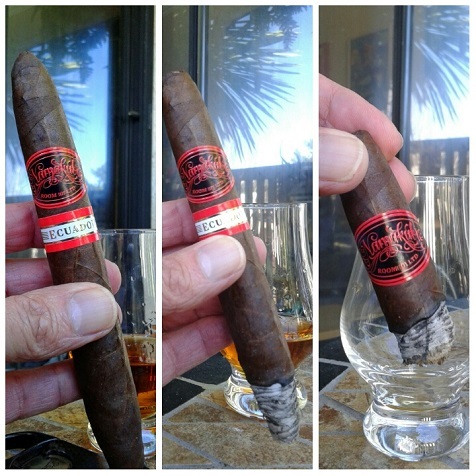 As I mentioned earlier, the parejo was a 2.5 hour cigar and by the time hour two rolled around my palate was somewhat dulled to it. But it never completely lost its nuttiness on the retrohale. I didn’t find a lot of pepper here. A little, but subdued all the way along the stick. These do keep flavors down to the end they just weren’t as strong to my palate at that point. That’s one of the reasons I like the papi chulo better. Maybe the bigger wrapper/filler ratio makes it even sweeter and the flavors stick around to the last 1/4 inch while you can still taste it. But I have to say the perfecto smoked evenly all the way down. These are a pleasure to smoke. The perfectos go for $7 to about $9 depending on the size while the papi chulo go for $6 each. That is a stretch for me in a petit corona, but how can I be without my favorite cigar?